Molte di voi erano curiose di sapere cosa c’era nei miei pacchetti Forever 21… ecco parte del contenuto! Insieme agli stivaletti di Zara che ho trovato in super saldo, dopo averli puntati per tutta la stagione! Un abbigliamento perfetto per il mio weekend al mare d’inverno… marinaro e floreale, mare e voglia di primavera! A lot of you girls asked what I bought at Forever 21… here is part of my buys! Together with the red ankle boots form Zara, that I was looking forward to put my hands on and finally found on sale! 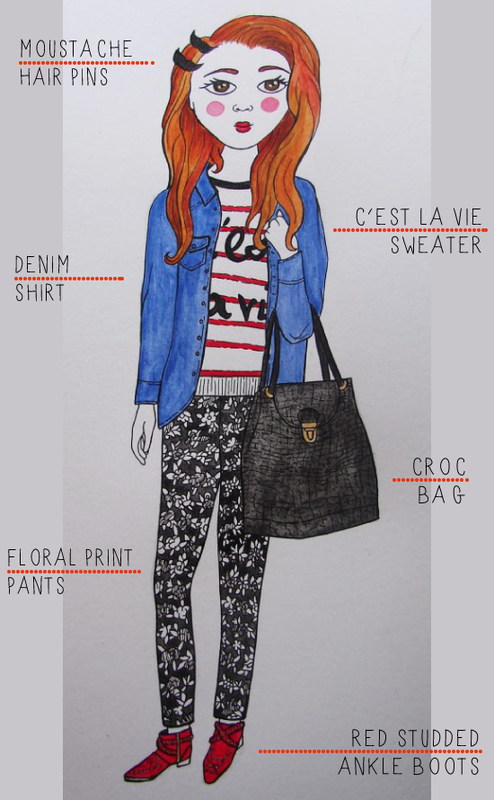 This was the perfect outfit for my Winter weekend by the sea… nautical and flowery! Forever 21 moustache hair pins, Forever 21 nautical c’est la vie sweater (purtroppo nel sito europeo è esaurita! 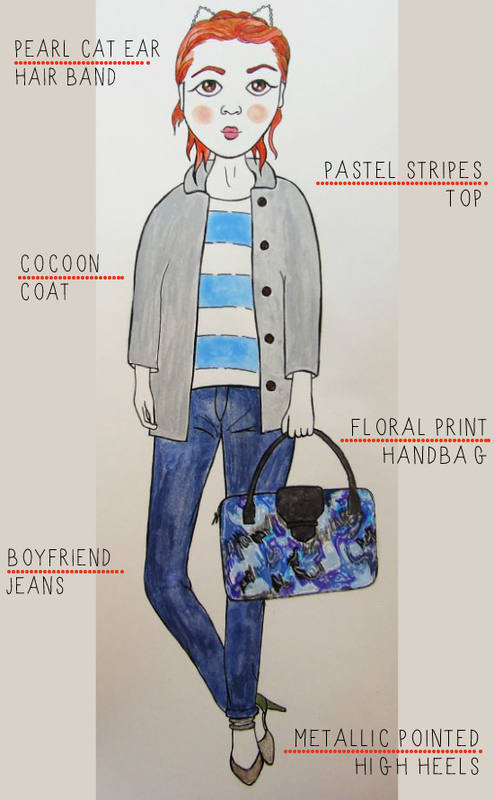 ), Levi’s denim shirt, Asos Croc Constructed Bag, Forever 21 floral print pants, Zara red studded ankle boots. Quando viaggio per lavoro spesso uso il treno. Per questo mi piace essere comoda, ma allo stesso tempo formale, senza dimenticare il mio stile colorato e vivace. Ad un bel paio di pantaloni classici, abbino una camicia in jeans e un blazer floreale e dal taglio classico. Una borsa che mi permetta di portarmi dietro l’IPad e ballerine, comode e perfette per ogni occasione. When I travel for work I usually travel by train. And so I like to be comfy yet formal, without forgetting to always be me with something bright and funny. 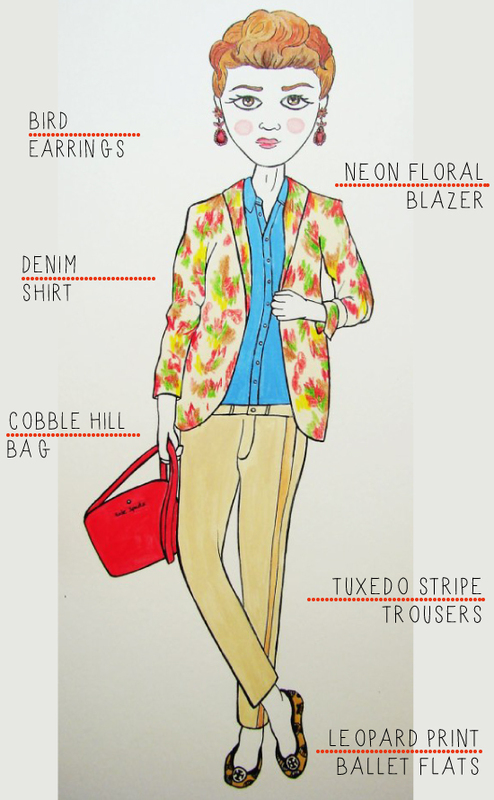 So I paired some classic tuxedo pants with a denim shirt and a floral tailored blazer. A bag that lets me take my IPad with me and ballerina flats. Asos bird earrings, Stella McCartney neon floral blazer, Pepe Jeans denim shirt, Kate Spade cobble hill tote, Anthropologie tuxedo stripe trousers, Tory Burch leopard print flats.